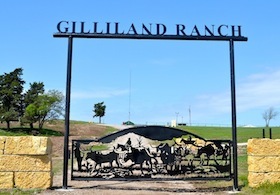 The Gilliland ranching history is a blend of a Scotch Irish ancestry--a banker/rancher, 3 cattle ranchers and a doctor/rancher. 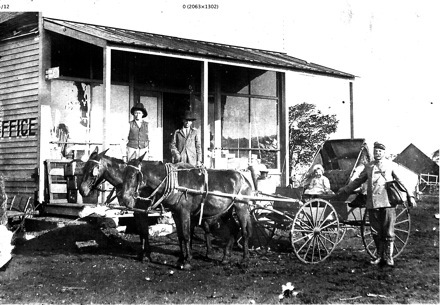 My great grandmotherʼs brother JJ Willson (1856-1938) was president of the local bank and ﬁrst purchased property in 1890 just south of the prairie town Hooser. 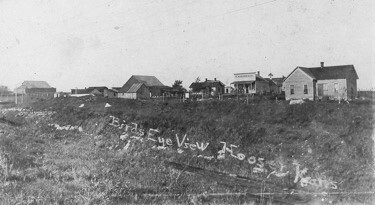 The town thrived on the commerce of the Missouri Paciﬁc Railroad which ran a daily train through Hooser shipping cattle (10,000 head/year) and prairie hay (15,000 tons/year) out of the Flint Hills. 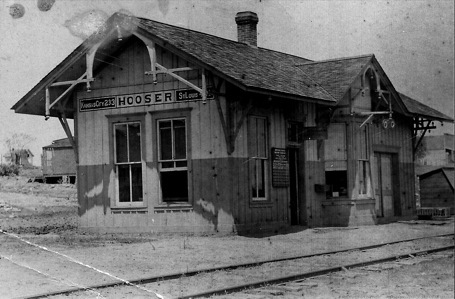 When cattle and hay started being shipped on trucks instead of trains, the railroad closed and Hooser became virtually extinct. 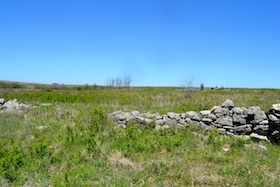 My grandmotherʼs lifetime bachelor brothers, Mike and Brady Meldrum (1888-1962), bought the town real estate in 1951.They became wealthy buying undernourished yearlings in Eastern New Mexico and shipping them to the Flint Hills tall grass where they gained 3-4 pounds/day. 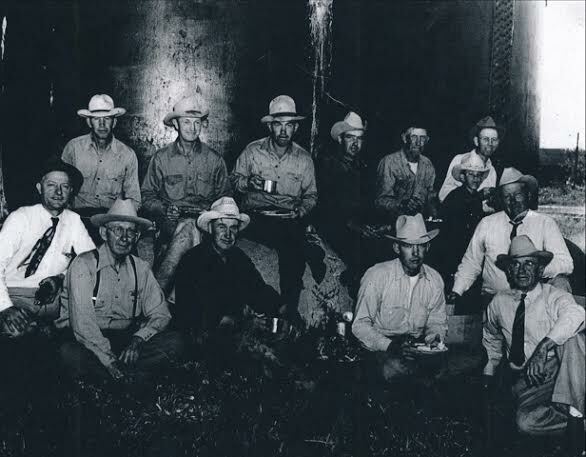 They taught the ranching business to my father Jim Gilliland (1925-2010) and he subsequently managed the ranch for 50 years. 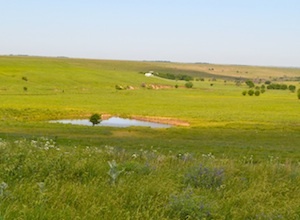 He was a major innovator in rotational pasture grazing and grass management to maximize weight gain in commercial cattle and simultaneously improve grass quality. 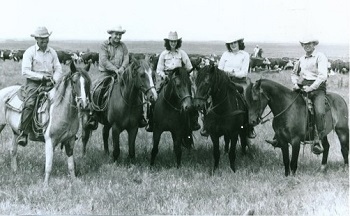 This was the primary reason that he was inducted into the Kansas Cowboy Hall of Fame in Dodge City for ranch management. 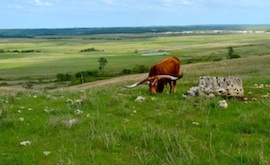 After spending 30 years in Texas practicing medicine, I returned to the ranch to carry on the 4th generation of ranching tradition. 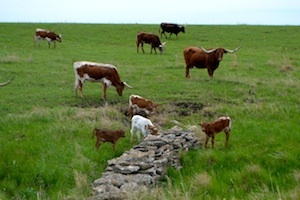 We currently have a herd of over 100 registered Texas Longhorns and have a strong genetic foundation in the $100,000 CV Cowboy Casanova, the $165,000 Cowboy Tuff Chex, RC Tsunami 2 ( Concealed Weapon X Pacific Mermaid). Our plan is to continue to strategically stack pedigrees with other promising outcross bulls and continue increasing horn growth. That said, we do not believe in single trait breeding and we are constantly balancing other desirable traits (size, color, disposition, milking ability, etc) that the market demands. 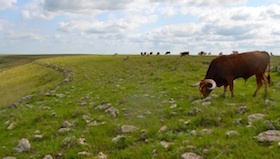 We are fortunate to have land ideal for Texas longhorns in the Tall grass prairie in the Flint Hills. 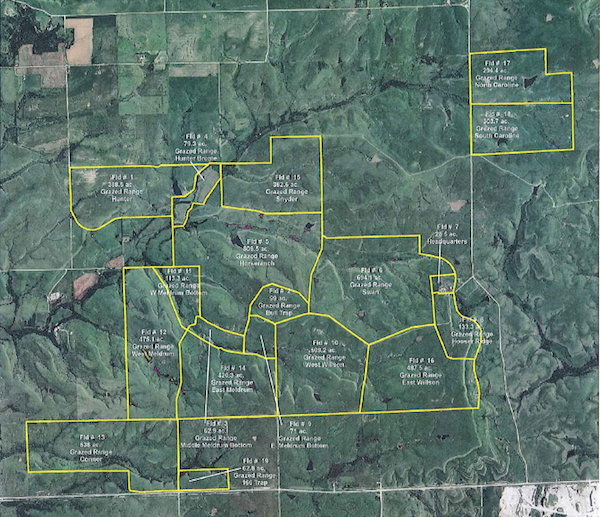 Read more about our ranch by clicking here. 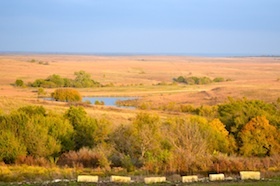 Hooser–A Kansas prairie town at the eastern edge of the ranch. 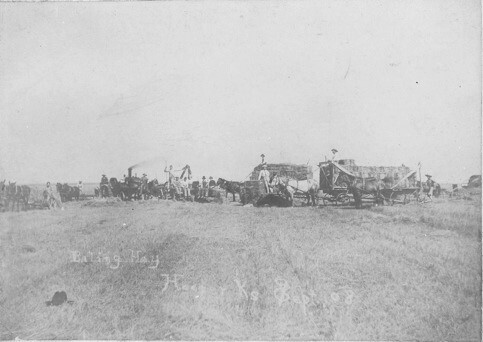 Baling hay in 1908. 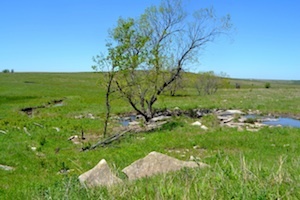 Hooser was a major source of prairie hay for US Army mules in World War I (15,000 tons per year). 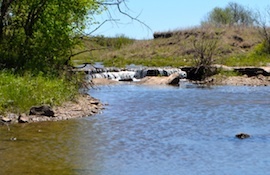 Streams are full and running. 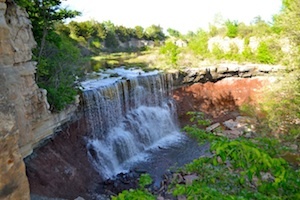 Waterfall just west of ranch. of ranch - life was harsh.